It’s time for another year of watching Marc Marquez make everyone else look like beginners! He surely loves America, seeing as he always wins in the US: six in Austin, three in Indy, and once at Laguna Seca. Heck, he even won twice at Indianapolis in Moto2, meaning he’s won his last 12 races in the US of A. It’s not like he’s showing any signs of slowing down, as last year he qualified on pole, was in the lead for every single lap, and had the fastest lap of the race, to boot. If that wasn’t impressive enough, he achieved the same thing in 2014 and 2016. I’m headed to Austin for the fourth year in a row, and I don’t care if Marc wins or not, I just want someone to make it interesting. First of all, thanks for your support and for checking out my shenanigans. I don’t take this opportunity for granted – last year Bike-urious was one of 16 websites that was given media credentials to the US round of MotoGP. In previous years, I’ve recounted my experiences each day. I’d like to sleep a little more this time around, so I’m going to be mixing it up a little. Still, my goal will be the same: share what Austin is like during MotoGP weekend to a casual fan (you know who Rossi is but you may have not yet heard of Fabio Quartararo). My hope is that my tales will inspire you to come check out the festivities for yourself in the future! I genuinely believe that this is the best motorcycling weekend in the US all year, and every one of you should check it out at least once, even if you’re not a race fan. The Handbuilt Show is an awesome celebration of custom bikes, and it’s an absolute delight to be surrounded by people as crazy about motorcycles as you are even when you’re just walking around the city or grabbing dinner. Nathan will be with me as well, getting his usual top-notch photos. There are 22 riders scheduled to compete this weekend, 10 of whom are factory supported. Of special note, MotoGP will retire the #69 of Nicky Hayden in a ceremony led by FIM President Jorge Viegas and Dorna CEO Carmelo Ezpeleta on Friday at noon. Nicky’s family and friends will be in attendance. 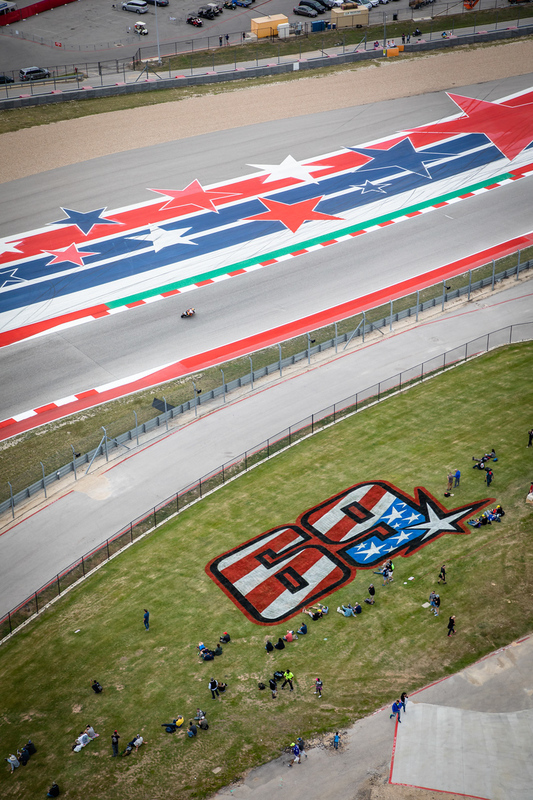 Circuit of the Americas dedicated a corner to Nicky last year. 1. Stream it online with MotoGP’s proprietary VideoPass. It’s not cheap but they do offer a free trial. 2. Watch it on TV. The US provider is beIN sports – you’ll have to figure out what channel that is for you. For live-ish updates, my silliest stuff will be on my Instagram stories. If you’re looking for a more professional look at this weekend, keep your browser pointed at MotoMatters to see what David Emmett has to think. Alright folks. My plane is about to land in Austin, so it’s time for me to “work”. I hope to see some of you here – remember that we’ve got a meetup scheduled on Saturday night. Whether you’re in town or thousands of miles away, I hope you enjoy! Featured Photo: The Red Bull girls from last year, because they seem to be the best way to get your attention to read my nonsense.